Somehow, I was made the leader of Sparkies (K-2nd grade). I feel woefully unprepared, but God's got a plan. 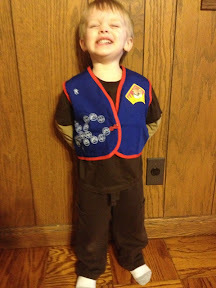 Tristan is a Cubbie (3 & 4 year olds). He was supposed to be a Puggle (2 & 3 year olds), but Helen thought he was ready to go ahead and start Cubbies because he's already good at scripture memory (he knew John 3:16 before we even started AWANA!). We are working in section 2 of his entrance book. He's got part one down! "A is for All. Romans 3:23 '...all have sinned...'"